Gabby Hartnett spent 19-years in the majors. 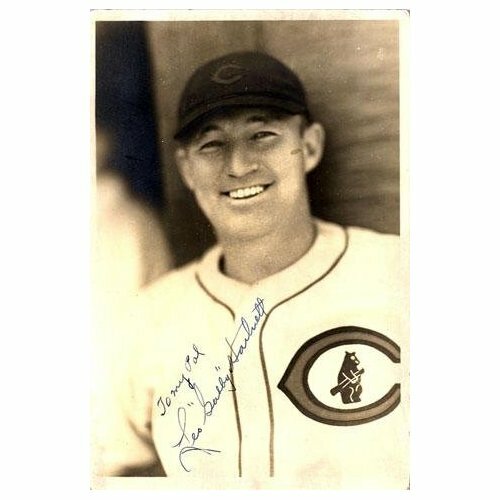 All but his final season were spent as a member of the Chicago Cubs. He was an outstanding all-around player and is widely considered to be one of the best defensive catchers of all-time. During his prime, Hartnett was a six-time All-Star selection and retired with a career batting average of .297. 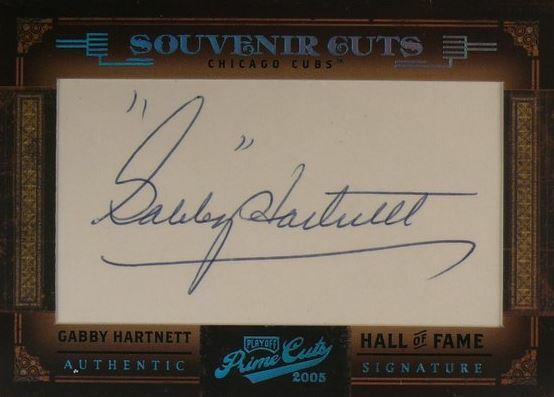 As a legend of the Chicago Cubs, Gabby Hartnett cards and memorabilia are popular with generations of Cubs' fans and pre-war collectors. His early cards can be quite valuable when found in high-grade condition. Hartnett played during an era in which defining a rookie card can be difficult. 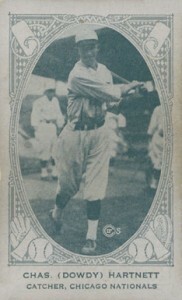 His earliest know cards were issued in 1922 and include releases by American Caramel and a W573 Strip Card. The two cards are identical and differ only in how they were distributed. The American Caramel E120 was inserted in the candy packaging while W573 was a standalone release. As was common for the era, Hartnett has numerous cards that were issued as premiums for various products ranging from candy, ice cream and other food and beverage. One of his most popular cards from his playing days is from the 1933 Goudey set. 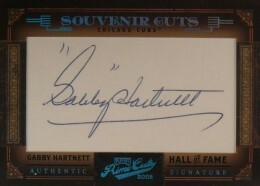 All of Gabby Hartnett's autograph cards are of the cut signature variety. The first of these cards was released by Upper Deck in 2001 SP Legendary Cuts. There were a total of 32 produced and each is serial numbered. To date, Hartnett has not had a memorabilia or relic card, of any kind. The rarity of his game-used material has made the acquisition of such items cost prohibitive for trading card manufacturers. 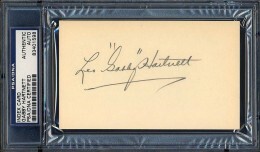 Authentic autographs of Hartnett do exist in the market and are most commonly found in the form of paper collectibles like checks, index cards and photographs. Signed baseballs are much rarer and carry a significant premium. 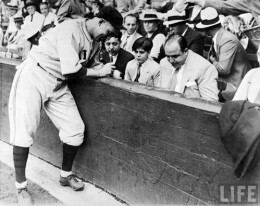 Interesting to note is that Hartnett was the subject of some controversy when he signed a baseball for a young boy prior to a game. That boy was Al Capone's son and the moment was captured on film. It is one of the most iconic images from the time period and appeared in Life magazine. These cards are designated in the American Card Catalog as E120's. They measure 2 x 3 1/4 inches. For some inexplicable reason, his nickname is wrongly shown as Dowdy. This is easily Hartnett's most popular card from his playing days. It is part of one of the most revered pre-war sets. 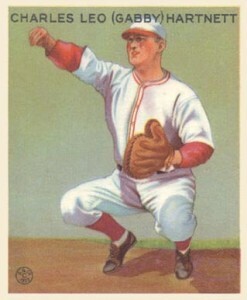 The card shows Hartnett throwing from the catcher position. This is fitting because he is well known for his defensive prowess. He had one of the best arms in baseball and regularly led the league in runners caught stealing. Below you will find an example of what Gabby Hartnett's authentic signature looks like. This can be used as a first point of reference for determining the legitimacy of autograph memorabilia, but is not a substitute for having your items authenticated by a well-respected professional autograph authentication company. Some of the trusted sources within the sports memorabilia market include the following companies: PSA, JSA, Steiner, Mounted Memories and Tristar. Click on any of the images below to view full size photos. It displays a pride of penmanship that continued even into his later years. The letters "L" and "G" and "H"are larger than the other letters. He almost always signed with his legal first name followed by his known nickname. The "L" has a distinct formation on the bottom of the letter resembling the number "9." The name Gabby is usually within quotation marks. The "G" could be mistaken for an "S" and has a long narrow oval loop at the top portion of the letter. The "H" is written from an angle that comes up before beginning the down stroke. It crosses low on the letter with the second vertical stroke being much longer than the first. The "t"s are all written like a lower case "l" and then crossed. 1933 Goudey #202 Gabby Hartnett HOF Cubs SGC 1 ! !